Free! (フリー！) is an anime series directed by Hiroko Utsumi and produced by Kyoto Animation and Animation Do. The series' first season, Free! - Iwatobi Swim Club, began airing in Japan from July to September 2013. 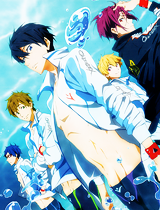 Its second season, Free! Eternal Summer, aired the following year from July to September 2014. In December 2015, an animated film was released, titled High Speed! -Free! Starting Days-. The anime series is based off of the light novel High☆Speed! (ハイ☆スピード), written by Oji Koji and published in July 2013. The light novel's sequel, High☆Speed! 2, was published in July 2014. Free! begins with Nanase Haruka, Tachibana Makoto, Hazuki Nagisa and Matsuoka Rin as children. Members of the local swimming club, the Iwatobi Swimming Club, the four participate in a swimming competition and swim a medley relay together, emerging as the victors. The team parts ways, however, with Rin moving to Australia to pursue his dream of becoming a professional swimmer. Years later, Haruka and Makoto reunite with Nagisa, the latter eager to swim with them as a team again. Unfortunately, however, Iwatobi High School is without a swimming club. Nevertheless, Nagisa tells them that the old Iwatobi Swimming Club is being closed down. The three venture in at night to visit the place of their childhood and to collect their old relay trophy, their prize for winning the competition years before. Inside, they have an unexpected encounter with Rin, who has recently returned from Japan. Hostile and unfriendly towards his old friends, Rin challenges Haruka to a race. Eventually, Haruka, Makoto and Nagisa form a swimming club for their high school along with Matsuoka Gou, Rin's younger sister, and Ryugazaki Rei. Meanwhile, Rin joins the swimming club of his own school, Samezuka Academy. Although they will be meeting each other as rivals in the coming swimming tournaments, Haruka and the others hope to mend their broken friendship with Rin and, perhaps, to figure out why it fell apart in the first place. Nanase Haruka, a 2nd year student of Iwatobi High School and a freestyle swimmer. Despite being talented at swimming and loving the water, he quits the sport during middle school for reasons only he can speak of. Matsuoka Rin, a 2nd year student of Samezuka Academy and a freestyle and butterfly swimmer. As a child, he was in the swim club along with Haruka, Makoto and Nagisa before moving to Australia. Years later, he returns to Japan, but as a changed person. Tachibana Makoto, a 2nd year student of Iwatobi High School, a backstroke swimmer and the reason why this site exists. He is the captain of the Iwatobi High School Swimming Club and a childhood friend of Haruka's. (More info can be found below!) Hazuki Nagisa, a 1st year student of Iwatobi High School and a breaststroke swimmer. Bubbly and cheerful, he reunites with Haruka and Makoto in high school and, after some convincing by Nagisa, the three begin a swim club. Ryugazaki Rei, a 1st year student of Iwatobi High School. A man of logic and beauty, he's roped into joining the Iwatobi High School Swimming Club in the middle of the first season. He swims the butterfly. Matsuoka Gou, or "Kou," a 1st year student of Iwatobi High School and Rin's younger sister. Noticing the change in her brother, she resolves to return him to his old self again and joins the swim club as its manager. She's also a muscle enthusiast. Haruka's best friend since childhood. Cheerful, kind-hearted and thoughtful, he often tries to mother-hen over Haruka. He tends to go all-out when swimming. A supporting character of Free!, Tachibana Makoto is a 2nd year student of Iwatobi High School and a childhood friend of Haruka's. As a child, Makoto joined the Iwatobi Swimming Club and eventually convinced Haruka to join as well. As the years passed, however, Makoto eventually stopped swimming along with Haruka. After reuniting with Nagisa, he agrees to the idea of starting a swimming club in their high school—so long as Haruka agrees as well. With the club underway, he is soon elected as the club's captain. Although his height and physique may make him an intimidating figure, Makoto is gentle and caring in nature. Always supportive of others, he proves himself to be a reliable teammate and friend throughout the series. Also he likes feeding stray cats and taking care of goldfish. This is very important. His voice actors include Suzuki Tatsuhisa and Satsuki Yukino (as young Makoto) in the Japanese version and Johnny Yong Bosch in the English version.